UPDATE: Crossroads has talked with an Insurance Adjuster, and the company that installed the building and the frame is intact. They will be up and running again soon. Crossroads Therapeutic Riding Center started their 2012 classes Monday evening in the Ronnie Delay Arena, and just a few hours later, the future of the arena is in question. 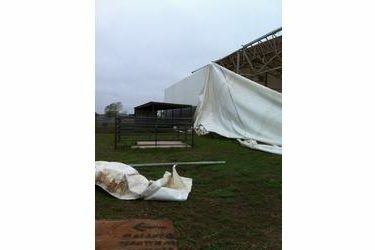 During last nights storms, gusty winds or even possibly a small tornado, took out 60 feet of the Crossroads Riding Center Arena. According to Rena Cross, Executive Director of the Center, the incident occurred sometime after 10:30pm. Cross stated that the horses used in for therapies, were not in the arena part of the building, but were in the runs. No horses were injured, but Cross felt they might be traumatized. Officials are currently assessing the damage to Crossroads with an insurance adjuster. Board members and staff will be meeting soon to discuss the evaluation and come up with a plan of action. Crossroads Therapeutic Riding Center offers therapies to children and adults who suffer from mental and physical disabilities. Crossroads has been in existence for over 14 years, and is located 8.5 miles east of the 6 Points Intersection on Bluebell Road. If you would like to help in any way, contact Rena Cross at 620-629-5107.